I love trying new skin care products. I really liked Upper Canada body butters. I tried almost all the variants and this time for winters I got pressed olive avocado variant for me. 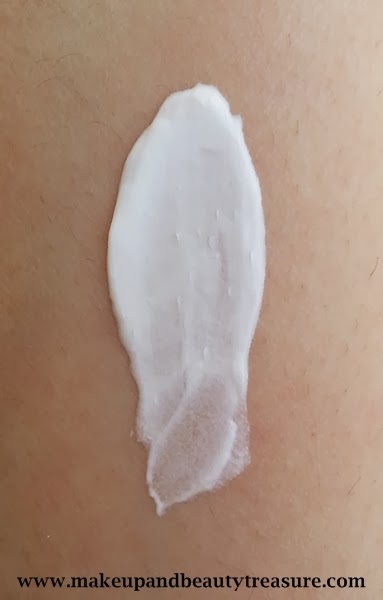 I tested it at Faces store on my arms and was actually impressed by its soft, smooth and silky texture. 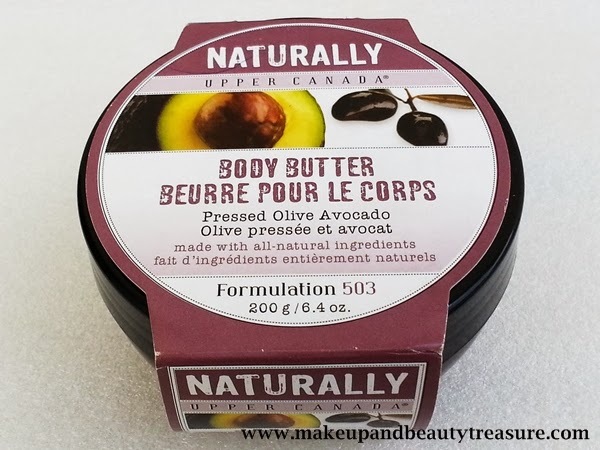 Today I am going to discuss my experience with Upper Canada Naturally Pressed Olive Avocado Body Butter. Variants available: Warm Honey Nectar, Pressed Olive Avocado, Wild Mint Lime, Cranberry Moro orange, Sweet Vanilla Fig. Upper Canada Naturally Pressed Olive Avocado Body Butter comes in a glossy maroon plastic circular tub with a black screw top lid. 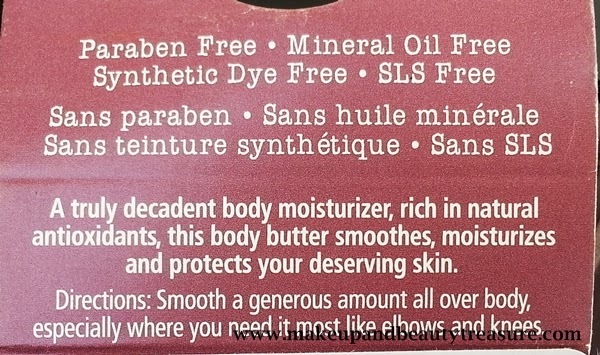 There is a flap around the tub that depicts the detailed information about the body butter. A separate sticker has been stuck at the bottom of the tub that shows lengthy list of ingredients. The packaging looks quite classy and elegant. It is travel friendly and the lid is easy to unscrew and screw back without any hassle. Upon unscrewing the lid, you are greeted with a fresh and lovely smell of avocado that is neither very strong nor very mild. 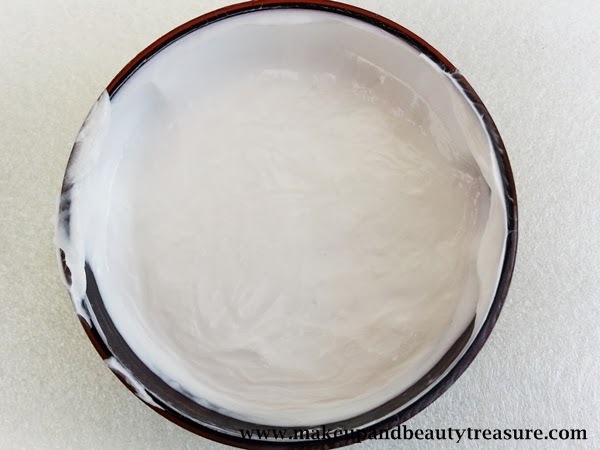 The body butter itself is white in color. 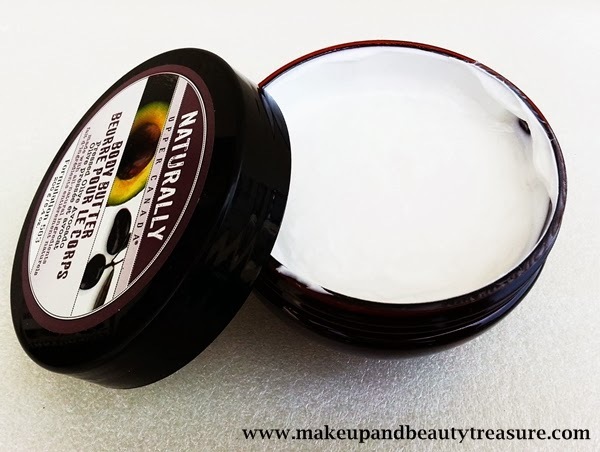 The texture of the body butter is different from other Upper Canada body butters I have tried. It is very soft, smooth and silky to the touch with a creamy consistency. I simply massage a small amount of body butter into slightly damp and clean skin. The body butters tend to sink easily into the skin when applied after shower. No excessive rubbing is required due to its smooth and creamy consistency. 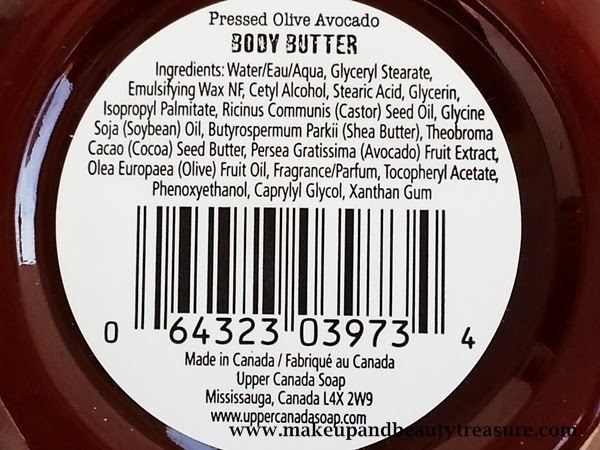 Upper Canada Naturally Pressed Olive Avocado Body Butter absorbs really quickly without leaving a greasy residue behind. It leaves my dry skin feeling very soft, smooth and hydrated the whole day. It feels extremely luxurious on my skin. After application, I don’t feel the need to wash any remaining product from my hands. The scent of the body butter lingers with me for a long time. The body butter takes good care of the dry parts of the body like elbow, knee and undersides of the feet. It contains cocoa butter, shea butter, glycerin and avocado fruit, olive oil as ingredients that leave my skin beautifully moisturized. The body butter lasts for around 4-5 months as only a small amount is needed and I don’t stick to the same one. It is suitable for daily use and I have not suffered any adverse effects while using it. I had tried Warm Honey Nectar, Pressed Olive Avocado, Wild Mint Lime, and Sweet Vanilla Fig and none of them have let me down. If you ask me to choose out of these, I would definitely pick pressed olive avocado. I really like its soft and creamy texture. It is not thick unlike other body butters. • Mild and refreshing scent. • Makes my skin extremely soft, smooth and hydrated. • The scent lingers with me for a long time. • Tub packaging seems somewhat unhygienic to me. 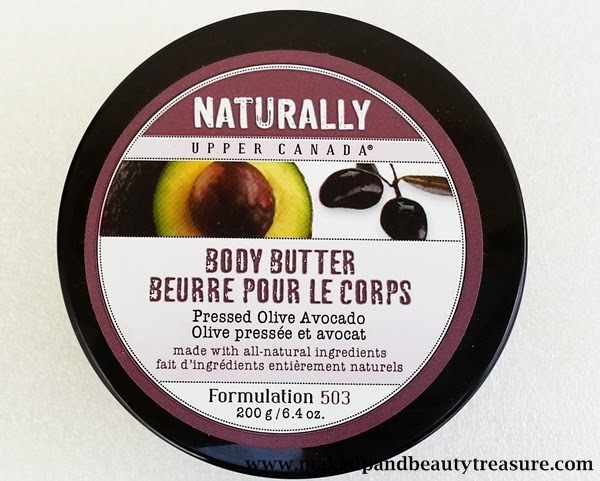 Upper Canada Naturally Pressed Olive Avocado Body Butter leaves my skin soft, smooth and moisturized the whole day with a lovely long lasting avocado scent. It does not feel heavy and gets absorbed instantly without leaving a greasy residue behind. I would definitely recommend it to everyone. 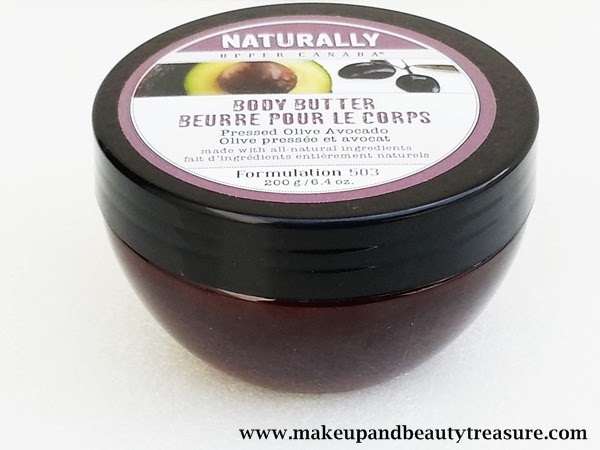 Have you tried Upper Canada Naturally Pressed Olive Avocado Body Butter? How was your experience? Share in the comments below! Hahaha thanx dear :) Do give it a try! This looks great and a must to try, I think I should get this soon. Lovely review Megha, such detailed review you write. Thanx Arzoo. Which body butter do u use? I love trying new things to help with my dry skin this looks great. Yeah gayatri its a great brand! Wow..looks great. ..loved ur clicks darling. .
Great review as alwyz. . So many all natural brands. Its nice there are brands which don't load skin care products with chemicals, but use natural ingredients. I agree. i loved this brand for its paraben free tag! Thanx Egle. It keeps dryness at bay in this weather! I too love sweet vanilla lot! Love the pics and nice review! This sounds as a good buy! i too would love to try it! Beautiful pictures and amazing review Megha! Seems like a good product. Never heard of this brand... but now that you have reviewed it and it sounds good..I want to try it soon! U ll love this variant Swati. Do try it out!